Commissioned Illustration for Caring at Christmas campaign. I was commissioned by amazing charity Caring in Bristol to illustrate a scene in the postcode BS5 from a series of facts and figures, to depict a visual representation of homelessness in that neighbourhood. 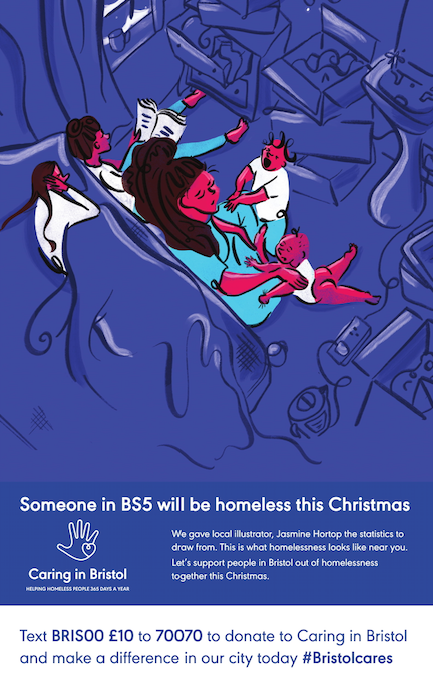 The campaign was their biggest to date, and the illustration was on flyers posted out to all the majority of households in Bs5, large A1 posters around the area, and across their social media channels.